Listen to the interview (approx. 1 hr, 28 min.) or download it. Graduated in 2013 with a major in Electronic Production & Design. Principal instrument: voice. Position: Associate Product Manager at NBC Digital. Andrew manages the NBC app for OTT (Over the Top) devices, such as Roku and Playstation video games, which can be used to stream NBC television content. Andrew works with designers, engineers, and somtimes the marketing team to make sure the new versions of the app come out with the desired features. He’ll write product specifications, manage the agile-development “scrum” meetings in which features will be planned, triage reported bugs to determine which need to be fixed right away, and helps Quality Assurance make sure the product is working correctly. Andrew also is starting a side business as a career coach. Overview: Andrew moved home to San Jose, California, after graduation, but planned to make it in LA. He went down to L.A. and stayed for most of a year, doing a couple of media-based internships and some side jobs, but struggled to make money and moved back home. In August, 2014 he got a contract job in L.A. as a mobile Quality Assurance tester at Disney Interactive, which was excellent experience but very low pay. A friend got him a better-paying job with the Far East Broadcasting Company, a small Christian media firm, where Andrew ultimately ended up producing their video and audio podcasts. However, he grew disenchanted with the work, and in the spring of 2015 left voluntarily in order to search for a job he would enjoy more. He moved back to San Jose, and soon a recruiter reached out to him for a contract media/data position at Apple, curating metadata for Siri. Andrew networked and applied for many jobs at Apple, hoping to turn this contract position into a career.. He also started learning to code, but wasn’t feeling it. While he was unsuccessful in finding a position at Apple, a manager for a position he applied for offered to meet and talk, and he told Andrew that based on Andrew’s experience and interests he should consider going into product management. Andrew researched what that career entailed “For the first time, I had a clear vision as to where I wanted my career to go. 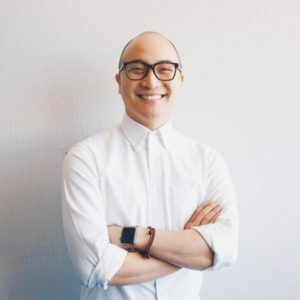 I vowed to become a product manager by the end of the year.” He did an 8 week “boot camp” Product Manager program at Product School in L.A., then applied to many jobs over the next two months. Right as he was about to move back home, he got two job offers is rapid succession, the later one for his current position. You can see Andrew’s LinkedIn profile here.